I’m all about One Dish Dinners. I wrote an entire cookbook with One Dish Dinners. And am currently experimenting with One-Dish Instant Pot Dinners. 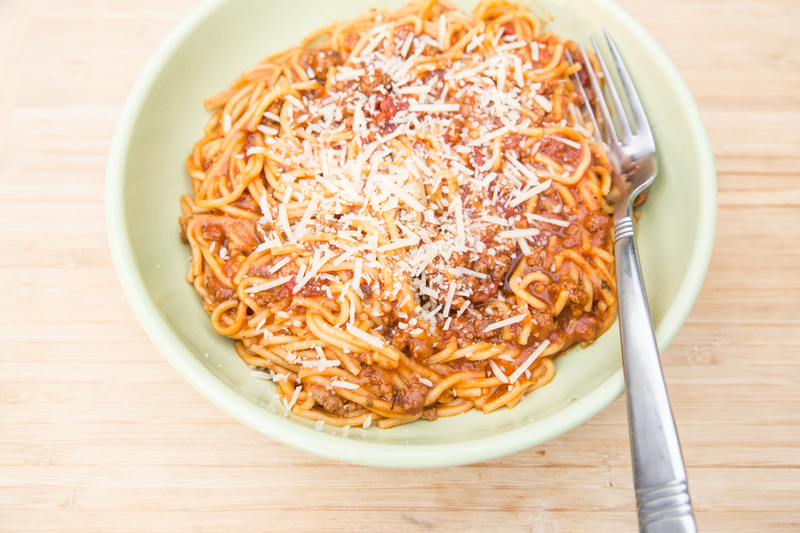 This one is a winner-winner-spaghetti-for-dinner. 1. Brown the ground beef on Saute mode. 3. Add the liquid and float the broken noodles into the saucy-liquid. A quick note on the liquid and sauce. 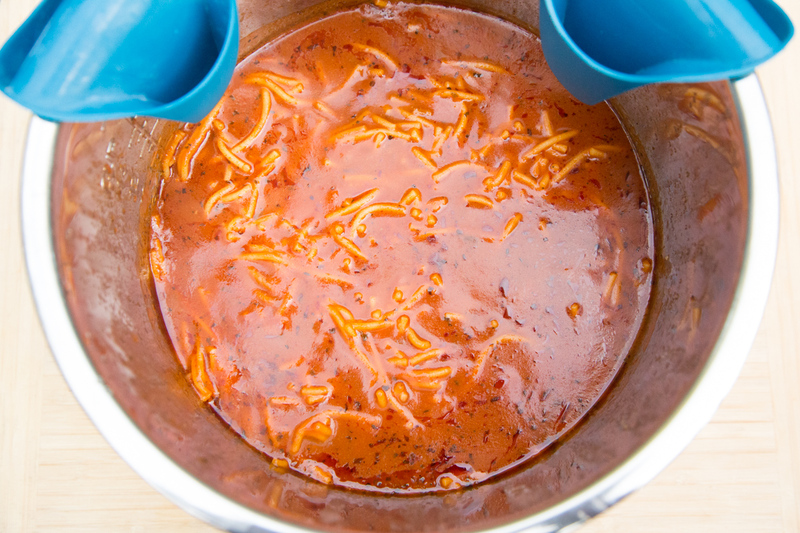 You want all of the noodles to be underneath the liquid, as best as you can arrange that. And the pasta will seem extra saucy when it’s finished, but give it a stir and let it cool off and thicken for a few minutes before serving. 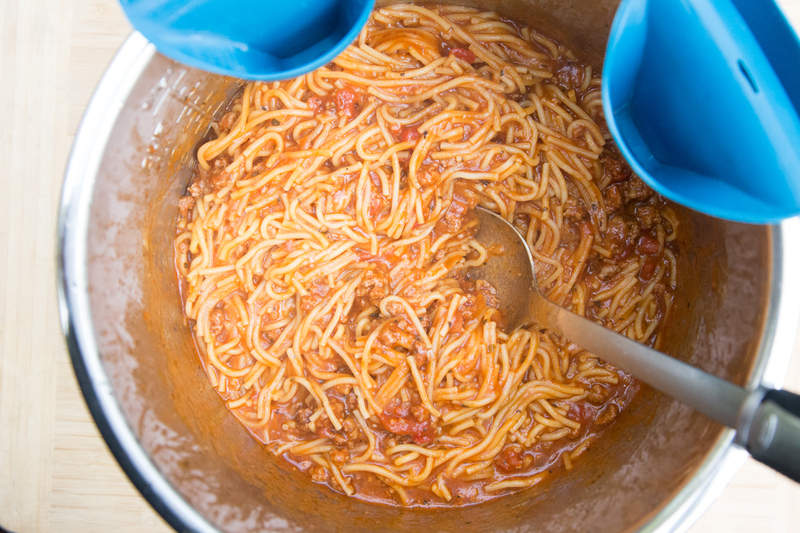 You shouldn’t need more than 4 cups additional liquid…if you do, then rearrange/position the noodles before cooking! Add the liquid and broken noodles. Nestle them under water as best you can! And it looks like this! PERFECTION! Blue Silicone Pinch Oven Mitts are available in our Shop! 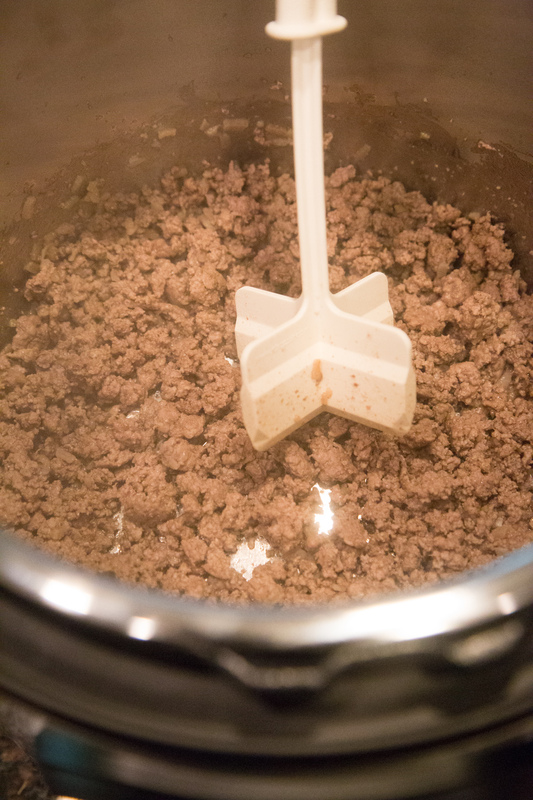 Add the ground beef, minced onion, and garlic powder to the Instant Pot insert. Set on Saute mode and brown the ground beef in the insert. 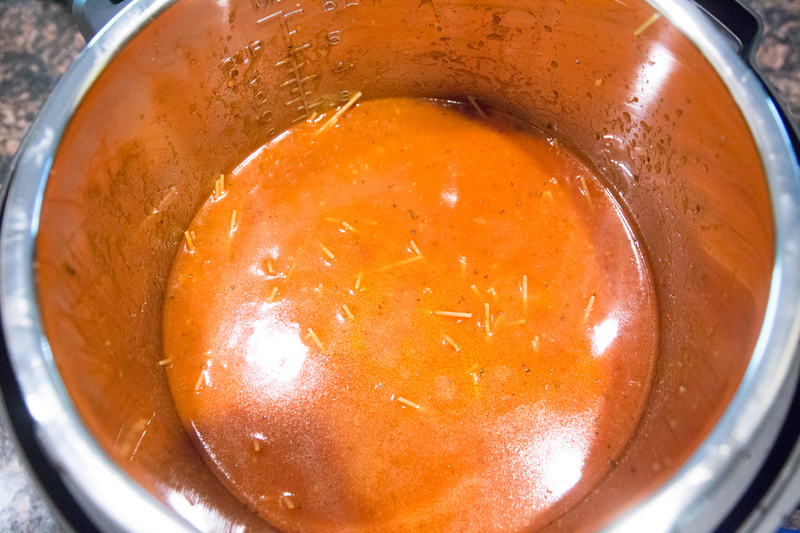 Once browned, stir in the marinara sauce. Break the noodles in half or thirds and mix into the sauce and then pour the beef/chicken stock/water over the top. Give it a gentle stir and then press all the noodles into the liquid. Close the lid, set to sealing. Set on Manual, High Pressure and cook for 6 minutes. Let naturally release for 5 minutes, then finish the release by setting to Venting. 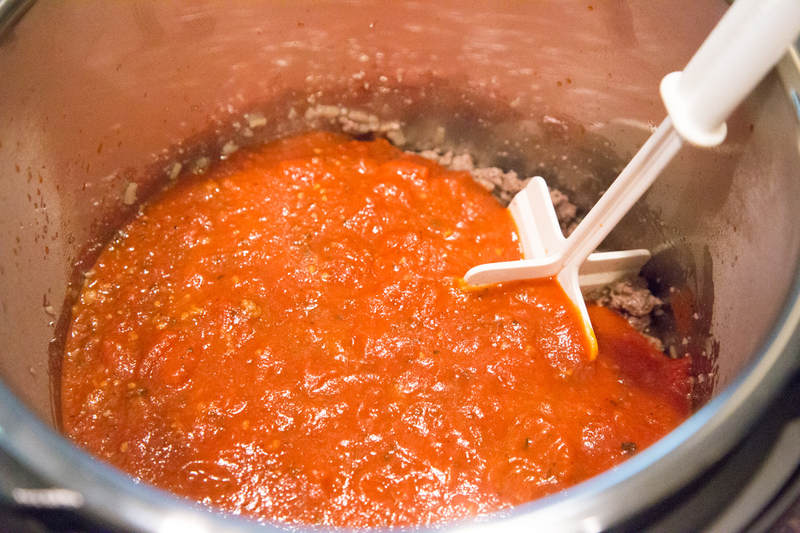 The sauce will look too thin, but give it a stir and it will thicken up with the pasta and meat. 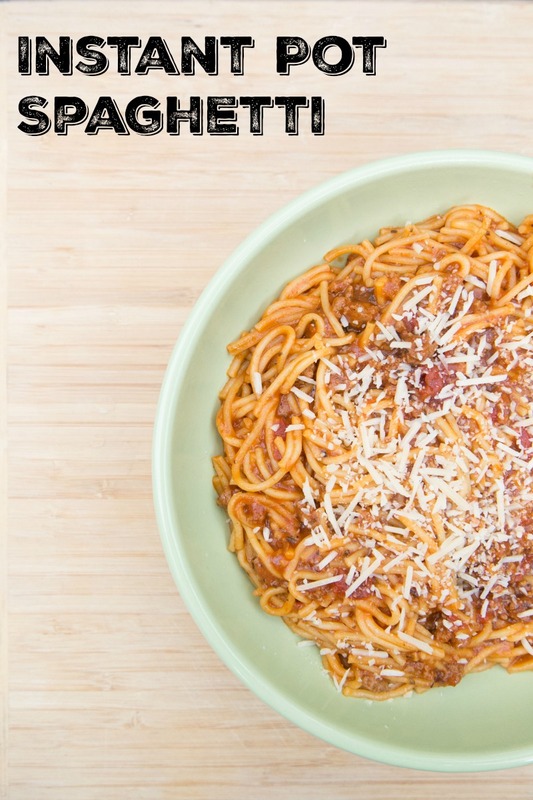 Serve Instant Pot One-Pot Spaghetti with Parmesan cheese garnish, and a side salad. This recipe is featured on SouthernPlate.com’s Meal Plan Monday #101. 1. Is the minced onion fresh or dried? 2. How much broth/water do you add (recipe doesn’t indicate)? How much water or chicken stock do we put in the pressure cooker? This ingredient was left out in the ingredient list. Have you ever tried to double this recipe? If so, did you make any changes?